Nobody at Porsche AG would ever admit it, but we suspect the newly upgraded 2009 Porsche Cayman has even more potential than the flagship Porsche 911. The new Cayman is set to make its public debut later today at the LA Auto Show and though it doesn't look much different, the car is boasting a new optional dual-clutch transmission that's sure to liven things up and provide improved efficiency. The car gets more power at 265 HP from the bigger 2.9 liter boxer and 320 HP in the 3.4 liter flat six in the Cayman S, which now trots to 60 mph in 4.9 seconds from a cold start. Here's the shocker in this whole equation - the added efficiency from that dual-clutch transmission allows the new Cayman to return 25.8 MPG in the 2.9 liter and 25 MPG in the 3.4 liter. As with the 2009 Porsche Boxster, the new Cayman should also sport a limited slip differential. What's that? A reveal video with driving footage and sweet, sweet engine sounds awaits below with the complete details? That's right. Next generation Porsche Cayman with increased power and efficiency Porsche is presenting the second generation of the mid-engined Cayman sports coupe at the Los Angeles Motor Show (November 21 – 30) this week. The highlight is the new, flat-six ‘boxer’ engines, developed to incorporate new technical features from the ground up, providing not only more power, but also significantly greater fuel efficiency. A further improvement of both fuel economy and performance is guaranteed by the Porsche Doppelkupplungsgetriebe (PDK), the new double-clutch gearbox now available as an option on both the Cayman and Cayman S. Newly-developed’ boxer’ engines deliver more power on less fuel The Cayman now has an engine displacing 2.9-litres, which develops 265 bhp (195 kW), an increase by 20 horsepower over the prior 2.7-litre model. The 3.4-litre power unit in the Cayman S now features Direct Fuel Injection, and delivers 320 bhp (235 kW), up by 25 bhp. These developments see the engines fitted to the Cayman and Cayman S coupes offering more horsepower than those in the Boxster roadster. This move emphasises the sports driving orientation of the Cayman and further differentiates the coupe. An outstanding power-to-weight ratio of 4.2kg/bhp on the Cayman S in particular ensures optimum driving dynamics. For example, the Cayman S with PDK and Launch Control (featured in the optional Sports Chrono Package Plus) accelerates from 0-62mph (0-100 km/h) in 4.9 seconds, setting the benchmark in the range. When combined with the PDK transmission, the new 2.9-litre engine of the Cayman clearly breaks through the 30.0mpg fuel consumption boundary. Indeed, the figure of 31.0mpg (9.1 litres/100km) is approximately 10 per cent better than the previous model with the Tiptronic S automatic transmission. Increasing fuel economy by an even more significant 15 per cent to 30.1mpg (9.4 litres/100km), the 3.4-litre Cayman S with PDK offers an even greater saving over its predecessor with Tiptronic S. In parallel with the improvement in fuel economy, so emissions of the engines have decreased also. Depending on model, emissions have been reduced by up to 16 per cent. The Cayman with the standard six-speed manual gearbox emits 221g/km CO2, and 214g/km CO2 when fitted with PDK. The Cayman S manual emits 223g/km CO2, and 221g/km CO2 with PDK. Significantly, these developments move every Cayman model – whether manual or PDK – into Band F for Vehicle Excise Duty and company car taxation purposes. Direct Fuel Injection standard on 3.4-litre S engine The driver benefits from a further advantage of direct injection every time they touch the throttle pedal: with fuel being injected fractions of a second prior to combustion, the engine responds more directly and spontaneously to even the slightest movement of the driver’s right foot. This is not only the case when accelerating, but also when lifting off the throttle, for engine speed drops more quickly and smoothly since there is no residual fuel left in the intake manifold which might otherwise prolong the combustion process. Depending on engine load and speed, fuel is injected into the combustion chamber at a pressure of 120 bar. The big advantage is that unlike conventional intake manifold injection, direct fuel injection serves to form the fuel/air mixture directly in the combustion chamber. This better mixes the air and fuel in the cylinder, establishing an important prerequisite for clean and complete combustion. This ensures the ‘homogeneous’ operation of the power unit with a consistent balance of the fuel/air mixture in the combustion chamber at all times and under all running conditions. Such smooth operation guarantees optimum combustion and maintains low emissions, across a range of fuel qualities. A coupé of distinction While instantly recognisable as a Porsche sports car, the Cayman is individual in its design. Originally launched in 2005, the characteristic silhouette of the Cayman has remained fresh and contemporary. Its distinctive coupé lines are combined with a long wheelbase and a rear aspect that slopes gently downwards. From the rear, the Cayman is defined by a large, opening rear lid, powerfully sweeping wheel arches and an automatically extending spoiler. The rear lid opens upwards to provide access to the 260 litre luggage compartment. This, in conjunction with the 150 litre capacity luggage compartment in the nose, plus numerous additional storage compartments, ensures that this two-seater sports car combines real functionality with elegant aesthetic form. As is Porsche tradition, the styling of the next generation two-seater Coupe has evolved subtly. However, it is clearly distinguishable from outside through its newly-designed nose and tail. The new halogen headlights with their integrated direction indicators are reminiscent of the lights on the Carrera GT, and the new LED rear lights tapering to the outside are integrated elegantly in the remodelled bodywork. The rod-shaped side lights in LED light conductor technology add distinction to the car’s looks, which are further enhanced through their horizontal arrangement in the outer air intakes. Yet a further highlight is provided by the round fog lamps featured as standard. For the first time the Cayman is available with a Lights Package featuring bi-xenon headlights, dynamic cornering lights and LED day-time driving lights. Replacing the fog lamps, these light units are made up of four LEDs arranged in round light units like the eyes on dice. PDK: quickly shifting gears, reducing fuel consumption The Cayman is available with the Porsche-Doppelkupplungsgetriebe (PDK) carried over directly from motor sport, and replacing the former Tiptronic S torque converter automatic transmission. When equipped with PDK, the Cayman accelerates from 0-62 mph (100km/h) 0.1 seconds faster than with the manual six-speed gearbox. Acceleration is particularly fast and dynamic with the optional Sports Chrono Package Plus featuring Launch Control; this offers maximum acceleration from a standing start and also a Race Track Gearshift Strategy for the fastest conceivable gear change as an exclusive highlight on the PDK models. Benefiting from Launch Control, the respective models accelerate from a standstill to 62 mph (100 km/h) yet another 2/10ths of a second faster. Porsche Doppelkupplungsgetriebe (PDK) – in detail The next generation Cayman and Cayman S are available for the first time with the new Porsche Doppelkupplungsgetriebe (PDK), literally Porsche double-clutch gearbox. Offering no less than seven forward gears, the new gearbox combines the driving comfort of a torque converter-equipped automatic transmission with the dynamic manual gearshift functionality of a sequential racing gearbox. PDK also boasts an entirely automatic gearshift function, and replaces the Porsche Tiptronic S automatic transmission previously offered. Through its optimised and adaptive gearshift programmes, PDK further improves the acceleration of the Cayman models and reduces fuel consumption to an even lower level. In principle, the PDK consists of a conventional manual gearbox and a hydraulic control system divided into two separate transmission units. Two wet clutches in radial arrangement, controlled hydraulically, and using oil for both cooling and lubrication, form the heart of the transmission. One clutch is for the first transmission unit with the uneven gear ratios (1,3,5,7) and reverse, and the other clutch is for the second transmission unit with the even gears (2,4,6). Via a number of pressure valves, the hydraulic control unit masterminds both the wet clutches and the shift cylinders activating the transmission ratio required. The gearshift perceived by the driver comes not from the gears actually changing, but from the change of positive clutch engagement. In this case, the clutch on one transmission opens or disengages while the clutch on the other transmission closes or engages in a simultaneous process. The big advantage is an even faster gearshift than with a conventional manual gearbox or torque converter automatic transmission. The gears are already ‘in mesh’ when shifting and the power of the engine need not be interrupted in the process. PDK also reduces to a minimum transmission power loss courtesy of the high standard of mechanical efficiency in the double-clutch, and this manifests itself in fuel economy improvements of approximately 13 per cent compared with a conventional Tiptronic S transmission. PDK also offers an advantage in terms of weight – despite two additional gears, it weighs 10kg less than Tiptronic S. To use the various functions of the double-clutch transmission, the driver can either shift gears by means of sliding buttons on the spokes of the new steering wheel, or via the new gear selector lever. The driver can press forwards to shift the gears up, and press them from behind to shift downwards. Alternatively, pushing the gear selector lever forwards shifts up a gear, and pulling it back shifts down. The option of PDK costs £1,961. This PDK gearshift principle was first developed by Porsche for motor sport 25 years ago. Porsche works drivers benefiting from this technology were able to accelerate faster than their competitors and keep both hands on the steering wheel while changing gears, thus avoiding even the slightest distraction while shifting. The seven-speed PDK shifts gears up to 60 per cent faster than a conventional automatic transmission, and naturally, gives the new Cayman models even better performance. And those in search of optimum driving dynamics have the option to combine PDK with Sport Chrono Package Plus, now featuring Launch Control. Dynamic suspension and supreme brakes – new option of limited-slip differential The suspension with its new set-up gives the new Cayman models a combination of even greater driving dynamics and enhanced comfort all in one. Modification of the valve control map on the steering gear serves furthermore to reduce steering forces, giving the Cayman more agile and spontaneous steering behaviour. The wheels come in new designs and are half an inch wider than previously on the Cayman 2.9-litre model in order to accommodate the larger brake system of the S-models which are now fitted on the front axle. The Cayman and Cayman S feature the latest generation Porsche Stability Management (PSM) which now offers two new functions: Brake Pre-Loading and the Brake Assistant. Whenever the driver lifts off the throttle pedal very quickly – which is typical immediately prior to an emergency braking manoeuvre – the PSM hydraulic control unit builds up an appropriate level of pressure in the brakes before the driver even presses the brake pedal down, which has the effect of moving the brake pads slightly towards the discs, and ready for immediate action. This significantly improves brake response and shortens stopping distances accordingly. When recognising that the driver is braking in an emergency due to the very fast operation of the brake pedal and a defined brake force, the PSM hydraulic control unit actively delivers the brake pressure required for maximum stopping power. In conjunction with 18- and 19-inch wheels, the new models in the Cayman range are also available with a limited-slip differential on the rear axle. Locking action is 22 per cent under power and 27 per cent in overrun. This significantly improves both traction and stability, providing a substantially higher level of performance on winding roads, particularly on the race track. A further advantage is the more stable load change behaviour. At the same time, the mechanical differential, through its particular function, interacts perfectly with the electronic Automatic Brake Differential (ABD) for optimum traction control, the locking action delaying the tendency of one wheel to spin on a road surface slippery only on one side. New audio and communication systems The next generation Cayman features as standard the new CDR-30 CD radio. The new Porsche Communication Management (PCM) 3.0 complete with hard disc navigation is available as an option and when specified serves as the central control unit for all audio, communication and navigation features. PCM 3.0 is more versatile, efficient and easier to use than before, standing out in particular through its touch-screen which enables the driver to select specific functions simply by pressing the appropriate key on the larger 6.5-inch monitor. PCM 3.0 is available with highly convenient voice control and, in conjunction with the optional, universal audio interface, can now be used also to control external audio sources such as an iPod®, USB stick, or Bluetooth. Seat ventilation combined with seat heating is also available as an option. 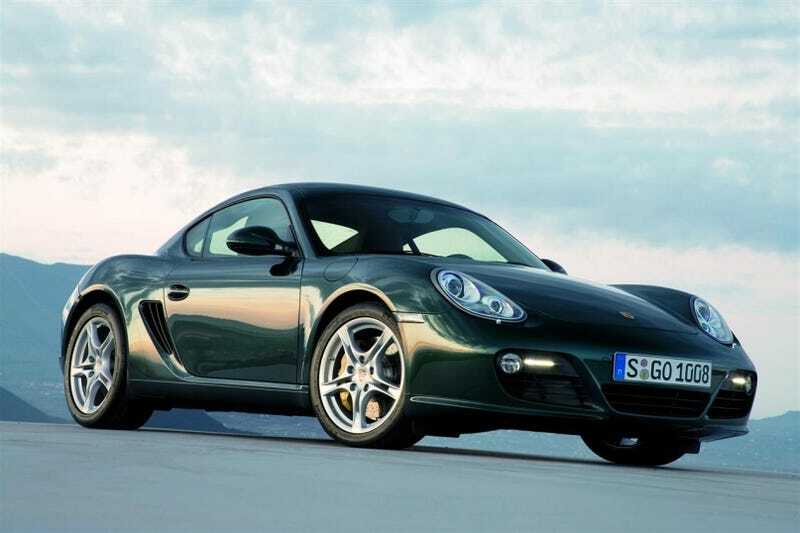 The next generation Porsche Cayman goes on sale in the UK and Ireland from February 21 2009. The Cayman is priced from £36,870 and the Cayman S priced from £45,050. Customers will also be able to explore the dynamic attributes of their car, and develop their own skills behind the wheel, courtesy of a Driving Experience Programme at the new Porsche Driving Experience Centre at Silverstone.